Roman Blinds combine the functionality of a window shade with the decorative impact of a soft furnishing perhaps better than any other blind type. Roman blinds look stylish and are easy to operate. 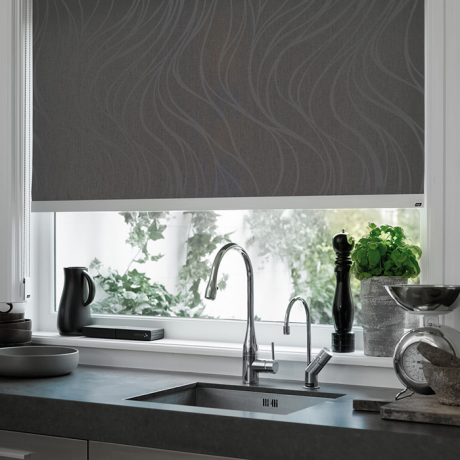 Our roman blinds fabric collection is a stunning range of fabrics, plains, patterned, blackout fabrics, printed fabrics, voiles, suede fabrics, water resistant fabrics, there’s plenty to choose from and all are made to measure to your exact specification. Cheshire Window Shutters roman blinds go one step further by endowing the roman blinds with fingertip adjustment. This is achieved by using the unique roller blinds mechanism as the preferred operating system – simply pull the chain to raise or lower the blind and the fabric folds deliciously as if by magic. Personalise your roman blinds by selecting a co-ordinating or contrasing fabric insert for the cassette mechanism or bottom bar, alternatively request a braid trim or detail to add to the bottom of the blind. The fabric choices available for roman blinds are extensive and cover all varieties of decorative themes and requirements. The only thing you will need to concern yourself with is which beautiful fabric to select. Contact us today to learn more about our Roman Blinds.